Irish music transcends all national boundaries, and yet expresses intensely the spirit of the place - that longing of all exiles for their home country. For the story of Irish music is also the story of centuries-long emigration to, especially, America and England. 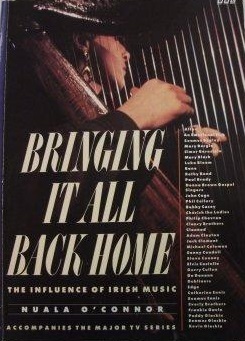 With a blend of social history, interviews with musicians and analysis of technique, this book attempts to chart some of those journeys, to visit some of the places reached - the Appalachians, Chicago, New York, London - and to provide an account of how Irish music eventually wound its way back home again, enriched, re-invigorated and changed. Way back, Irish traditional music belonged to remote rural communities - the hauntingly beautiful "sean nos", unaccompanied songs sung in Irish, the ballads, the jigs, reels, slides and polkas taught by itinerant dancing masters. But it was in America that Irish music re-invented itself, to meet the musical needs of the New World, and 20th-century technology also sent it off in new directions to meld with rock, country, pop, electric folk, blues and the avant-garde. This book chronicles those transformations, from the Clancy Brothers and Bob Dylan, Planxty and Clannad, to the Pogues, Van Morrison, U2, Sinead O'Connor and Christy Moore, and to John Cage's "Roaratorio". It aims to show, too, how modern music has been alchemized by the use of traditional Irish techniques and instruments like the bodhran, the harp and the uilleann pipes to form that unique sound that is so unmistakably Irish.